There are many destructive forces in nature. 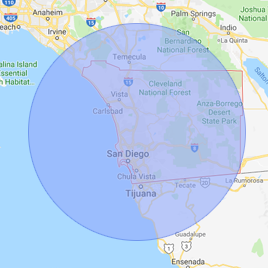 Fire can be one of the most dangerous of these forces, especially when it comes to homes and businesses in San Diego, Chula Vista, and Escondido. A fire can cause structural damage to your property while also leaving behind smoke damage. You may even have to deal with water damage from fire hoses and sprinklers. The professionals at 911 Restoration of San Diego know how to deal with all the issues caused by fire damage. We can take on commercial or residential fire damage. Our crew has the resources to handle the damage caused by large or small fires in order to get you back on your feet quickly. Soot, ash, and smoke restoration is an important aspect of the fire cleanup process. The crew at 911 Restoration of San Diego understands the importance of focusing on big issues and small details to totally restore your property to perfect condition after a fire. Our crews can even help you handle issues caused by puffback from your furnace. We believe you deserve professional help with puffback cleanup and major fire damage. Call us today so crews can begin formulating a personalized restoration plan just for you. Protecting your property from the elements after a fire can limit the amount of restoration services you need in the long run. Taking care of fire damage restoration can mean removing excess water from your property, taking care of structural damage, and focusing on smoke removal. Ash and smoke damage can cause lasting issues if they are not addressed promptly. That’s why the crew at 911 Restoration of San Diego focuses on smoke restoration alongside more obvious concerns. We utilize advanced techniques like sodablasting to clean up fire damage and fire cleanup crews will work tirelessly to restore all damage done to your property in a fire. Recovering from the effects of a fire in San Diego, Chula Vista, and Escondido can be much easier if you have professional help on your side. 911 Restoration of San Diego is a locally owned and operated company with years of experience handling fire damage restoration for both commercial and residential properties. You can rely on us to provide you with the tireless service you need to fully repair and renovate your home or business after a fire. Allow us to ensure you get your peace of mind back by offering you a Fresh Start after you experience a fire. Going through the fire damage restoration process can be less challenging if you have help from a company that always puts your best interests first. The smoke restoration crews at 911 Restoration of San Diego understand how stressful this process can be and we are dedicated to making things as easy as possible for you. Taking care of fire and smoke damage is important, but our techs also focus on small details to totally renovate your property. Crews can handle odor and smoke removal as well as smoke renovation to bring your property back to perfect condition. You can even count on us to handle puffback cleanup if you experience issues with your furnace in the winter months. Puffback cleanup may not be as dramatic as fire damage restoration, but 911 Restoration of San Diego takes puffback damage seriously. You deserve a clean and restored property for a Fresh Start as spring rolls around. Ensure you get the dedicated help you need after a fire in San Diego, Escondido, or Chula Vista. You can get same day service from experienced professionals by calling 911 Restoration of San Diego right now.